"Upon playing a good ten or so minutes of my first Contra 4 session, WayForward's contribution to the series prompted me to do something unexpected..."
Upon playing a good ten or so minutes of my first Contra 4 session, WayForward's contribution to the series prompted me to do something unexpected, with my mind urging me to replay the early Contra titles on the NES and SNES. 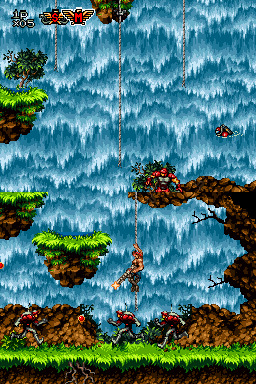 Since I haven't played any recently, I marched through the classics, and immediately remembered what made them so distinctive; Contra 1 has a mounting, but fair, difficulty curve that anyone can overcome without the cheat code, co-op, 80s action movie influences, and the standout base segments; Super C tweaked the formula for more balance, opted for overhead stages when felt like it, and has a very catchy soundtrack; Contra III updated the template even further with detailed, apocalyptic graphics, cool boss designs, and sensible additions to the protagonists' repertoire for a genuinely fun experience. With a series that's been around for over 20 years, it's understandable for a need to compare, but in my case, I did it more for concern. 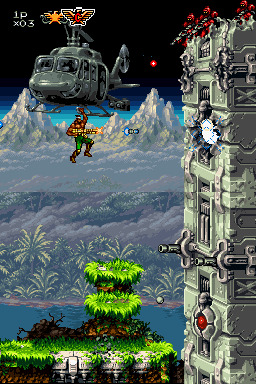 In the brief time playing the self-proclaimed 20th anniversary product, I was exposed to all kinds of things that one would recount if asked to describe a Contra title, from controlling a beefy, shirtless soldier firing a spreadshot at soldiers resembling human ladybugs, to exploding bridges in the jungle, and even a base stage. Along with blowing away these alien scum and scurrying to shoot down weapon capsules from the sky, an energetic soundtrack blasted away, filled with great remixes of familiar tunes. And after four 3D games, starting all the way back in 1996, Contra 4 transitioned back to a dominantly 2D art style reminiscent of Contra III's look, albeit with a crispier, detailed atmosphere. So, what's the problem? Well, my immediate issue was how, considering the game has the number 4 in the title, implying it be a follow-up to the aforementioned games, I was expecting a fresh adventure. Instead, the first three of nine stages are basically remakes of Contra 1's levels, with some Super C sprinkled in for good measure. Want to relive the jungle stage, except in daytime, has more bridges and hills that kinda resemble Sonic's Green Hill Zone, and a wall boss that's, pause, taller? Booyah! 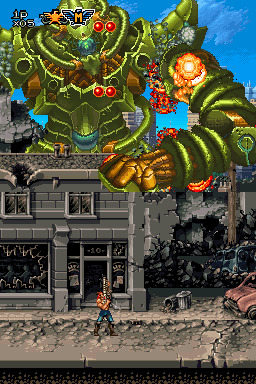 I mean, let's just forget that Contra III's first stage has you crashing through walls in an awesome tank, and featuring a ginormous turtle-esque boss with brain legs that clog 90% of the screen. Or how about wanting an ugly, third-person base stage with 2D character sprites imposed in front of dreary, 3D backdrops, and an inferior version of the encapsulated brain doppleganger that attacks with pills? Memories! I know past Contra products have borrowed elements and reused stages from their forefathers, but this game does so extensively to the point that I feel like it should've been named Contra Tribute or Contra Anniversary. However, rehashing stages isn't the biggest beef I have with Contra 4, and I was willing to be more forgiving had the combat been less vexing. Me? Not having fun with a tough Contra title? The same person who loves Hard Corps? While the game is often touted by many to be one of the hardest in the series... I truly believe it did the wrong things to earn that moniker. When I play a solid Contra title, I endure its hardships, overcome its challenges, and encounter one more important thing in the process: fun. 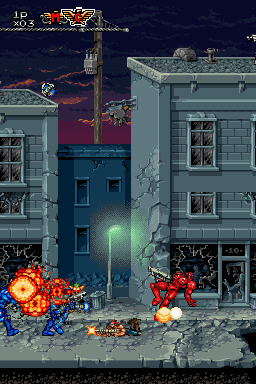 Contra 4 follows Shattered Soldier's angle of meticulous difficulty, whereas being at the wrong place at the wrong time immediately punishes the player, so precise memory is required to pass certain segments without a scratch. Now, Shattered Soldier is a tough game, but it didn't really go overboard with its approach, however, WayForward went through great pains in crafting a product that forces gamers to play a very specific way. I can't even comprehend the time it took them to place stationary enemies in the right spots, knowing full well the player would try squeezing by without attacking, and killing on sight. Or programming an enemy in such a way that, if the player was hanging on a bar, and missed a flying enemy that swooped down literally an inch away, the alien's charge attack would begin with a slight dodge, knowing full well the player would try shooting again. With some practice, you can prevail over these trials and eventually blaze through most of the game without... too much trouble. However, the path is a frustrating one, and continues to irritate even after you know what's coming up next. Imagine those two scenarios mentioned above, except on a scale where enemies, from zombies exploding into eight directional pieces in a cramped hall and crawlers falling out of holes, to H. R. Giger-esque aliens rushing the area, are cramping the screen every which way. What's worse, if you're occupied, and stationary enemies are just barely on screen, like, one pixel, they'll start shooting disturbingly precise shots or grenades in your direction. Then there's the issue with the dual screens, where action is occurring on both sides. 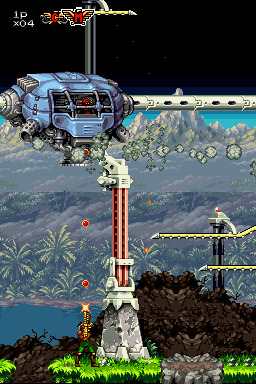 It sounds like a cool gimmick for a Contra game, that is, until you actually try it out. The problem is obvious: your character is only on one screen at a time, while enemies, bullets, and what not are everywhere. Since a gamer is clearly going to be focusing on their protagonist's screen when stuff is getting intense, I shouldn't even tell you there will be cheap deaths aplenty. Worse, when objects, especially lethal ones, travel between screens, you lose track of them since they're still moving through the space you can't even see, making it often times irritating trying to dodge stuff. The dual screens work just fine when the action slows down and concentrates on a vertical plane, such as brief moments in stage two's waterfall segment, but in everything else that's speedy, the concept just falls apart. Seriously, Contra 4 takes being killed from off screen to new extremes. Taking the methodical angle to greater lengths is how the default weapon is now frustratingly weak, further pushing players into doing near-faultless playthroughs in order to get anywhere. Power-ups, especially when upgraded to their second form, play a huuugggeee role in defeating strong opponents and bosses throughout, as fighting one with just your original weapon results in multiple deaths or a boring, drawn-out battle. The second stage's boss, a remake of the waterfall alien boss from Contra 1, is an irritating battle when prolonged, since the creature forces up the platform you're standing on real close to its head when letting loose giant projectiles. 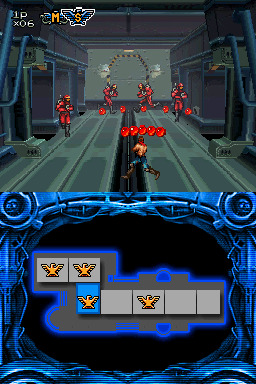 As well, the entirety of stage seven, a clear nod to Contra III's first level, is a nightmare with a default, as your soldier needs to repel everything from the man-faced mutts, the red and blue skeleton robots, and the gigaflies in absurd numbers, along with hazards galore. 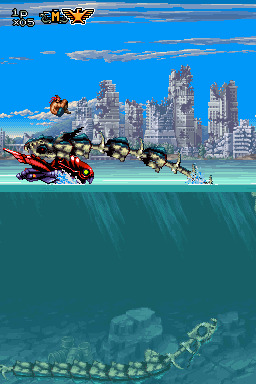 The greatest example for being severely punished while equipped with a crummy weapon comes when playing the fifth stage, an ocean auto-scroller where you ride a weird, alien ski boat. The mutant fish in the beginning move too fast to completely destroy before they jump out of the water and blow bullets from different angles, forcing you to dodge in the limited movement that's available. Next, two giant skeleton fish float around in the water below, and if not dealt with quickly, they'll keep jumping in and out of the water with no discernible patterns. 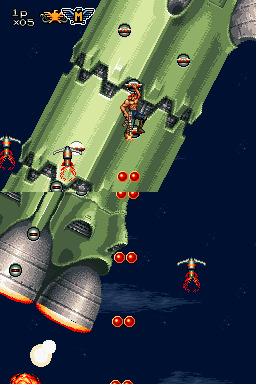 Afterwards, a cruiser comes out of nowhere and unleashes a row of flying robots that move erratically around both screens, shooting slow, shaky, homing missiles. Fun fact: one time a homing missile exited the left side of the top screen, then reentered the left side of the bottom screen where I was. Joy! And, with a default weapon, you'll be treated to one of the most risk-heavy boss fights in the game, as you can only hit the weak spot when it's leaving the screen, and while you hover over flying fish and spikes. When I finally defeated the last boss on Normal mode, it was the first time in a long while that I was happy to do so in a game, especially since I never succumbed to using cheat codes. I wish I can say it was because the journey was amazing, but it was due to how I never had to do that again. Usually, when I finish beating an enjoyably hard action game, I take a stab at the higher difficulty settings for fun, but the thought of doing that with Contra 4 gives me a headache. It's really a shame I feel this way, because the game looks great, the boss designs, such as the towering robot that looks like a customized Zaku, are cool, and it plays just like a typical Contra title. But when it comes down to it, the difficulty feels overwhelming. Sure, there's an Easy mode, but the fact that you immediately receive a power-up's strongest form from the get go, along with weaker enemies and how you can't complete the entire game, feels insulting. You know what's funny? I think I've spent more time in Challenge Mode, where one needs to complete specific conditions in certain settings, than I have in the main one. The challenges are often really hard, like completing a segment with a 100% hit ratio, running through the waterfall stage without a weapon, or making it past the first half of stage four with limited ammo. Sometimes I would fail a task 12 or so times in a row before passing, and once I even spent two straight hours just completing stuff. Why is this a better mode? I dunno. Maybe it's because there's clear goals in mind, or that the game's lunacy is presented in short bursts. Doesn't hurt that it actually feel like things are getting accomplished, especially with rewards like extra characters, such as Sheena from Hard Corps and even Probotector! You can also unlock imperfect versions of NES Contra and Super C, featuring odd effects and choppy music. You'd think a 20th anniversary title that acts like some kind of greatest hits amalgamation would be a neat idea when given to the right development team. And for the most part, WayForward really went the distance in creating a nostalgic Contra experience, clearly showing they were passionate about the project. Maybe they wanted to pay tribute to the franchise's legacy for being one-hit kill wonders, and I'm sure there are gamers that love this iteration for being audacious. I don't mind hard, but when I stop enjoying a game because it feels more like work, then that's a serious problem. If you enjoyed this Contra 4 review, you're encouraged to discuss it with the author and with other members of the site's community. If you don't already have an HonestGamers account, you can sign up for one in a snap. Thank you for reading! None of the material contained within this site may be reproduced in any conceivable fashion without permission from the author(s) of said material. This site is not sponsored or endorsed by Nintendo, Sega, Sony, Microsoft, or any other such party. Contra 4 is a registered trademark of its copyright holder. This site makes no claim to Contra 4, its characters, screenshots, artwork, music, or any intellectual property contained within. Opinions expressed on this site do not necessarily represent the opinion of site staff or sponsors. Staff and freelance reviews are typically written based on time spent with a retail review copy or review key for the game that is provided by its publisher.